Saturday started out as any normal rodeo Saturday. We slept in. I love it when the rodeo starts at 1pm. That is just the best. It lets us sleep in and enjoy the morning. Then we hustled around to get things ready and we hit the road. I will share some random photos. I know some people can only stand so many rodeo pictures. And especially when my rodeo pictures look the same every week. My boys just ride at a walk. So, nothing too exciting. Oh, except that Big Cowpoke did manage to get his horse into a lope! He about cut his 1 minute and 40 second barrel race time in half! I was so excited for him. He was excited too. He was wearing spurs. He said, "With these spurs on, I am now a cowboy!" He is so funny. 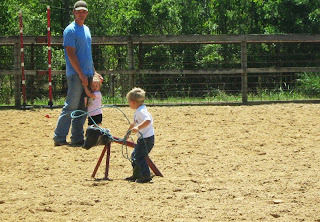 Little Cowpoke loves the dummy roping. He actually got third place. 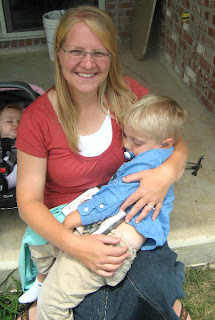 Out of about 8 kids. His time was 31.2 seconds. All the other kids had missed the dummy!! But hey, he got some money back. Maybe we should practice more. Have him learn to pull back on the slack end of the rope, not the circle part. I have no idea what that part is called. 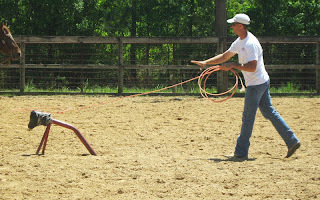 I am so not a roper. I can't even begin to explain how horrible I am at roping. Big Cowpoke really tried hard, but he missed. We have been practicing, but I guess we need to do it a little bit more. But I think he has good form. Then there is this roping crazy man! Mr. 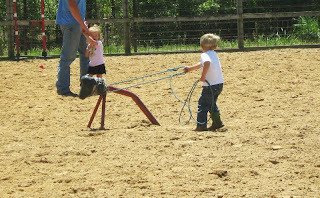 Cowboy roped that dummy in 3.1 seconds! Wow! But too bad a girl beat him at 2.5 seconds. I think he did a pretty good job. 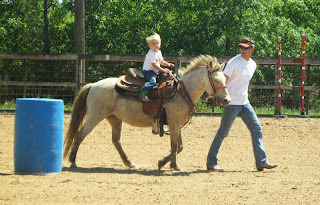 Considering he was a rough stock rider and not a roper! He sure is doing a wonderful job. Mr. Cowboy even humors me and rides barrels, poles, and much much more! Little Cowpoke insisted on riding Buttercup. She is the super fast pony. I was a bit nervous about it. She gives the boys rides at home but that is where she is not being run around barrels at a super fast speed. But she was good. She wanted to trot and Little Cowpoke was not to thrilled about that. So, he went back to good old Pretty Girl, the 21 year old hag. But after everything was said and done, around 9 pm, the boys were ready to go home. 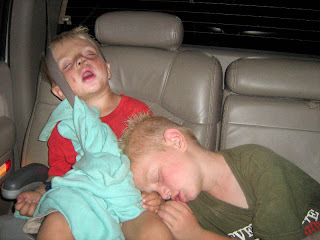 It doesn't take long for them to fall asleep. You can so see all the nasty dirt on Little Cowpoke's face and all the sweat on Big Cowpoke's head! Didn't I tell you how really nasty they get? But boy do they have fun. Now onto mother's day! The boys and Mr. Cowboy got me a really huge card! They all signed it and then they gave me the movie "PS I love You". Mr. Cowboy made me breakfast and lunch and he tried with dinner. But it was really nice. He also took care of the baby most of the day and got up with her all night. It was sweet. 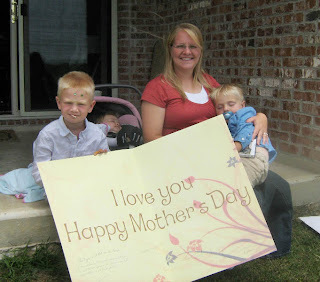 I wish every day was mother's day! He is such a good sleeper. Some day I will get that blanket away from him and that pacifier and he will become potty trained. But just someday. Right now I like holding him. Then Big Cowpoke took over the camera and I became a super model. He isn't too bad with the camera. Too bad the model could use some work!! Ha ha ha! 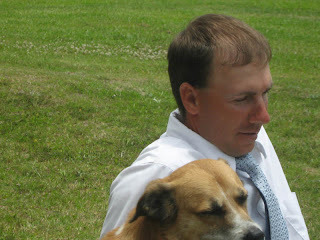 Then Big Cowpoke got a great shot of Brodi and Mr. Cowboy. 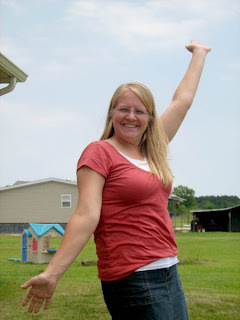 He took some more pictures of me and Mr. Cowboy together but oh, how horrible I looked. I was sporting a serious fat roll in all of the pictures, so I thought I would spare you all from having to look at them. But, that was our weekend! I hope you all had a great Mother's Day. What fun! 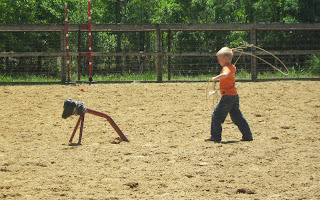 Our kids would enjoy rodeos way more than 4-H shows. And look at that card! Happy Mother's Day, belated of course. So, what is a lope? ?